Tour length - Approx. 9.5 hours (Pick up time - approx 8.00am; Drop off time - 5.30pm) depending on pick up location and time of year. Departure points - various central Perth locations including hotels and the Wellington Street coach stand - go to www.exploretoursperth.com/departure-points for the full list. Penguin Island is a unique nature reserve that is home to Western Australia’s largest colony of little penguins - the smallest species of penguin in the world. Penguin Island is blessed with beautiful beaches and is surrounded by dazzling, crystal clear waters. Located inside Whiteman Park, Caversham Wildlife Park is Perth's premier wildlife experience and a must-see on any visit to Perth. Hand-feed the kangaroos, join in the interactive farm show, touch a possum or lizard, meet a wombat, and have photos taken with koalas! Caversham Wildlife Park; a great Australian meet & greet experience for the whole family. Board the ferry from Mersey Point Jetty for the shot five minute journey to Penguin Island. Spend some time exploring the Island whilst looking out for Penguins, Pelicans and a wide variety of other Australian wildlife. Board a Glass Bottom boat for a 45 minute glass bottom boat cruise to view rare Australian Sea Lions, Pelicans and great views of the Islands. Drift over the sea grass meadows and limestone reefs spotting fish, crabs and other marine life through the glass bottom. Lunch is served back on the mainland at the wonderful Pengo's café where you have the choice of a fine selection of hot and cold food. After lunch you jump back in our Explorer bus and head toward the Swan Valley and Whiteman Park. 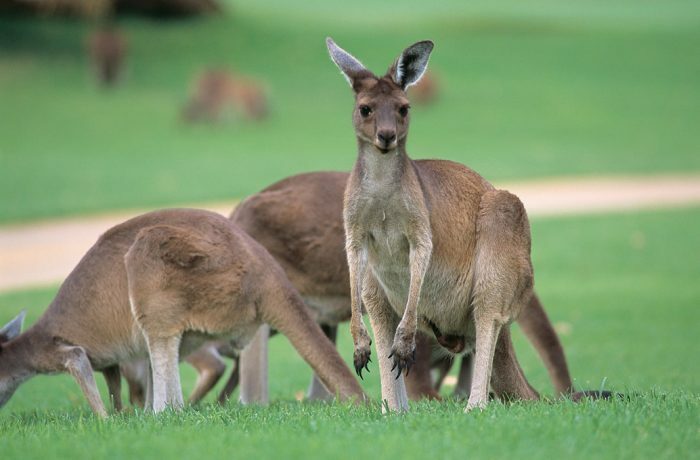 Watch out for wild Kangaroos as we drive into the Conservation reserve. Feed Kangaroos, have your photo taken with Koalas and meet a Wombat. Whilst in Caversham you will also have the chance to watch a live Australian Farm Show - watch sheep shearing, crack a stock whip, milk a cow, bottle feed a lamb, meet a stockman on horseback, swing a billy, watch sheep dogs mustering the sheep – all the excitement of a true blue Aussie farm! Important Note: On rare occasions the weather or tides may stop the Glass bottom boat and/or Penguin Ferry. When this happens the tour will divert to Mandurah for a scenic Dolphin cruise with lunch held at a restaurant in Mandurah instead.